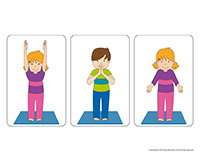 Mountain pose is a basic yoga pose, one of the first ones you can show children when first introducing them to yoga, since it is easy to execute. Children can successfully perform it from a very young age. Mountain pose can help children calm down. It may be used to improve their balance, tone the muscles in their legs, and reinforce their spine. It realigns their body and helps them focus on the present moment. Place your arms on either side of your body, palms facing forward. Remain perfectly still and focus on your breathing. Close your eyes if you need to. Open, print, and laminate the following document: (Open mountain pose). Show children the picture and let them see you doing mountain pose. Give them the basic instructions listed above. Do the pose with them. When should you use mountain pose? To help children calm down. To prepare children for a yoga session, start with mountain pose and encourage them to breathe in and out several times in this pose. To put an end to a series of poses, to re-center children’s focus on “here and now”. To take this pose a little farther, breathe in deeply as you raise your arms up towards the sky in a circular motion. Press your hands together in prayer. As you breathe out, bring your hands to your heart. As you breathe in, lift yourself up onto your tiptoes. Breathe out as you set your feet back down on the floor. Breathe in deeply and raise your arms up towards the sky in a circular motion. Your palms mustn’t touch. Bring your arms back down as you breathe out and return to your starting pose.